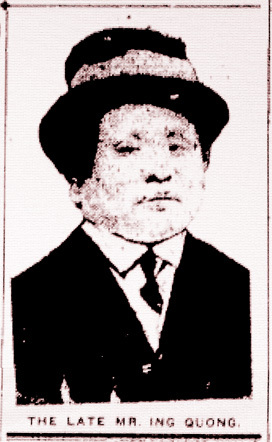 ◊ Note: This article describes the funeral of Toronto businessman Ing Quong and is presented in keeping with this website’s theme of early immigrant communities in the city of Toronto. The article, despite the cultural stereotypes it invokes, nonetheless is meant in the highest respect for the deceased and the community to which he belonged. There passed through the streets of Toronto yesterday afternoon on its way to Mount Pleasant Cemetery, a funeral that was followed by many curious eyes. An express wagon laden with flowers preceded the band of the Governor-General’s Body Guard. The bandsmen in their blue and white uniforms played slowly as they marched. Just behind them in the somber hearse lay the body of Ing Quong, a well-known Chinese merchant of Queen west, who died Monday. Following the hearse was a long line of cabs, nearly forty in number, and in these, with one or two exceptions, could be seen the dark close cropped heads and black-clad forms of Chinamen. There were three or four Chinese women also. In one of the foremost cabs a little almond-eyed woman in deep black wept incessantly. Beside her were two little boys of about nine and five years old. The three were the wife and children of Ing Quong. A larger boy, the oldest of the three children left, was in another cab. They sorely miss the husband and father, as do the Chinese community, their friend, for that Ing Quong was not only respected but loved was proved by the genuine sorrow in the faces of his friends, by the great number in attendance and by the multitude of beautiful and costly flowers. It is but a few months since Ing Quong was an active and enthusiastic participant in the Chinese parade that here celebrated the inauguration of the Chinese republic. He had marched taking the character and dress of John Bull. Today he was the chief figure ina very different procession. Sadly, yet clearly and beautifully, the band played “Nearer My God to Thee,” as the procession entered the gate of Mount Pleasant. The bandsmen stood in two rows on either side of the gate. When the last of the carriages had entered, many of the blue uniforms followed. Others who had been attracted hurried after, and presently, in a far corner of God’s Acre, there gathered around the casket nearly two hundred people. The flowers were placed near the foot of the grave, almost concealing a wide sloping bank of earth. From the outskirts of the throng, where the young wife stood came the pitiful sound of sobbing, and as the casket was lowered, an elderly Chinaman lifted the little five-year-old boy in his arms to gave gown upon it. The wife did not come near, but as she wept two other Chinese women, also in deep black and also deeply affected, tried to comfort her. Very still grew the crowd around the new-made grave. Chinese bared their heads, as did Englishmen, many closed their eyes and while the fitful sun shone down upon sad intent faces and smiling flowers, there came in the strange tongue words of earnest prayer from the young Chinese minister Rev. Mah Wah, who stood at the head of the grave. Before this he had read from the Christian Bible, printed in Chinese, a short chapter. This, with the prayer, constituted the entire service. There was no burning of incense, no worship of ancestral gods, for a few years ago Ing Quong became a Christian. In the town of Sun Wai, China, Ing Quong was born, forty-seven years ago. He has been in Toronto eleven years, and owned the store of fancy goods and general merchandise at 99 Queen street west. Some weeks ago it became necessary for him to undergo an operation, and from this he did not rally. 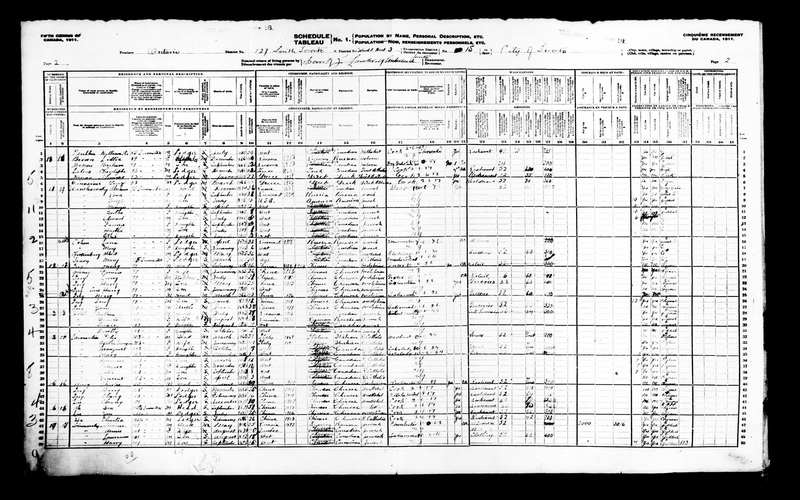 Below: Ing Quong and family at 99 Queen Street West in the census of 1911.